This book is a comprehensive guide to the natural history of the North Slope, the only arctic tundra in the United States. The first section provides detailed information on climate, geology, landforms, and ecology. The second provides a guide to the identification and natural history of the common animals and plants and a primer on the human prehistory of the region from the Pleistocene through the mid-twentieth century. The appendix provides the framework for a tour of the natural history features along the Dalton Highway, a road connecting the crest of the Brooks Range with Prudhoe Bay and the Arctic Ocean, and includes mile markers where travelers may safely pull off to view geologic formations, plants, birds, mammals, and fish. Featuring hundreds of illustrations that support the clear, authoritative text, Land of Extremes reveals the arctic tundra as an ecosystem teeming with life. Alexander Huryn is a freshwater ecologist and a committed field naturalist who has worked extensively in the Smoky Mountains, New Zealand, Panama, the Alaska Arctic, and Iceland. John Hobbie is a senior scholar at the Ecosystems Center, Marine Biological Laboratory in Woods Hole, Massachusetts. He is a founding researcher of the Toolik Field Station in Alaska and former director of the Arctic Long-Term Ecological Research Project there. 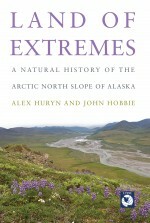 Land of Extremes: A Natural History of the Arctic North Slope of Alaska (cover photo).